Ulster Director of Rugby Les Kiss has praised the character shown by his players following a month which yielded four victories from four outings. 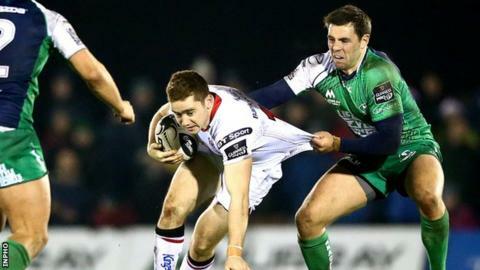 The Irish province edged out Connacht 10-3 in their Boxing Day Pro12 game. "You can talk about character and guts but these guys define it every week in the way they go about their business. "We are growing with each game and we have a lot to be confident and pleased about. Teams gain confidence from winning tight matches," argued Kiss. Prior to the last-gasp win at the Sportsground, Ulster had beaten Edinburgh in Belfast and banked back-to-back Champions Cup victories over Toulouse to boost their European hopes. "We have won away against two teams who hadn't been beaten at home this season and we will see what that means in terms of momentum when we face Munster at Kingspan on Saturday. "This a fairly crucial part of the year and things can change very quickly, so we won't be taking anything for granted." The former Ireland assistant coach was fulsome in his praise of Ulster's defence in Galway, but added that the squad still have "a few things to work on". "To defend the way we did against Connacht with the amount of ball they had, particularly in the first half, was very pleasing and shows the heart and soul of this team. "We went off plan a couple of times but managed to get back on track. We displayed a deep resolve and a willingness to fight hard for each other. "Our breakdown work wasn't maybe as good as it could have been and we got isolated a few times but we will work on that." Ulster should have captain Rory Best back for the visit of Munster, having been rested for the Connacht game. Fellow Ireland international Chris Henry should also return after injury.